The Wind + SUP is new to the O’Shea inflatable SUP range for 2016 and has been CAD designed and tested by the man himself – Farrel O’Shea. It comes in one size only and is recommended for use with O’Shea’s soft sail rig package, available in ‘Grom’ sizes (2.0m or 3.0m), or the ‘Wind’ rig in 4.5m or 5.5m. According to O’Shea, the Wind + SUP is constructed using the “highest quality Mirasol Korean drop stitch fabric money can buy”. It is complimented with use of ‘1000D’ PVC on the hull and deck (said to be better than the material used by most premium boards out there) and a wide double rail tape band to boot. It is certainly made to last, feeling reassuringly sturdy as you pick it up – easily the most ‘heavy duty’ inflatable on review here. Fittings are durable and robust, with a wide webbing handle, large EVA deckpad, reinforced deckplate insert, front towing eye, rear leash eyelet and strong fixing points for the net on the nose. It comes complete with a pump, repair kit and O’Shea’s pro backpack. The plan shape of the O’Shea makes it visually quite distinctive, its wide tail and parallel rails providing a lot of connection with the water, before the squared off nose rises right at the end, more akin to nose kick than rocker. As such, it has great traction and directional stability, helped all the more by the increased area of the central fin. It is a fine board for windsurfing – a great tutor and perfectly applicable for the complete novice. As the wind increases, the WIND+SUP copes as you’d expect a dedicated windsurfing board would; yet its inflatable design helps it to rise and accelerate smoothly without losing its connection with the water. One of the key aspects, we think, is the inflatable board’s thickness and at 4.75”, the O’Shea exhibits the ideal qualities of stability and float, without losing control as the conditions turn on. In paddle mode, the O’Shea is noticeably heavier underfoot and takes more effort to build up a head of steam. 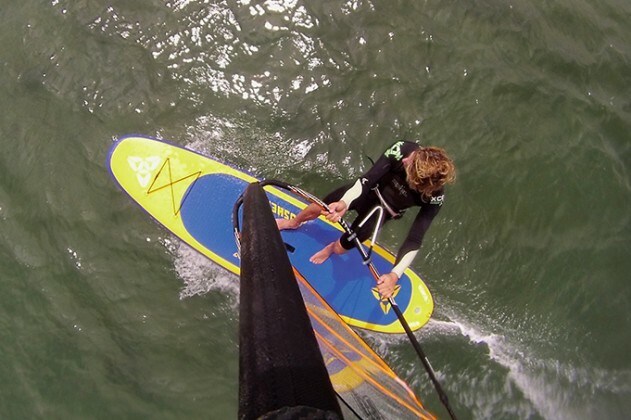 It is definitely a windsurf-biased board that can be used for SUP cruising if the wind has disappeared. With the durability to provide years of service, it is also an excellent realistic option for the windsurfing school as well as the family plaything.